Dauntless Software (dba "Dauntless Aviation") provides quality aviation products to customers throughout the world and has sine 1997. 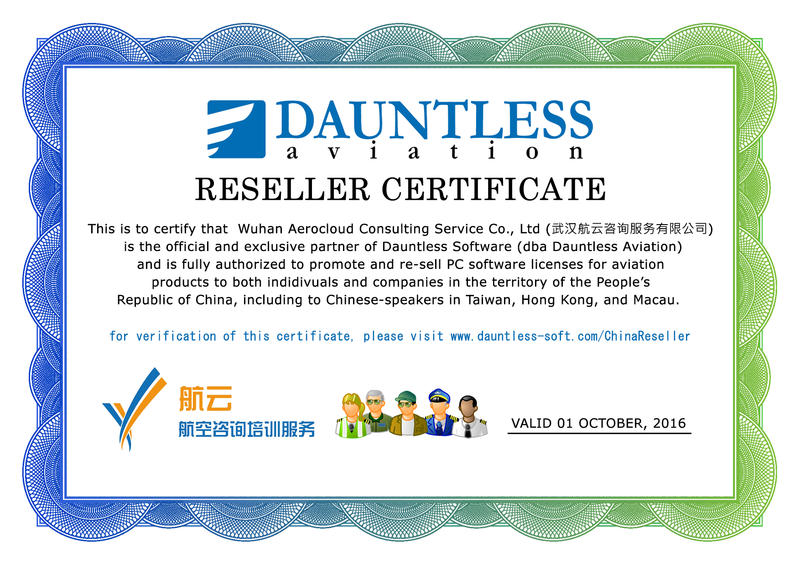 In order to best cater for the specific needs of users in China, we have partnered with Wuhan Aerocloud Consulting Service Co., Ltd who are our authorized representatives in China. Individual or corporate/organizational/educational customers in China wishint to purchase bulk or individual licenses of our products in China should do so via Wuhan Aerocloud Consulting Service Co., Ltd. (Business License). To further verify this certificate/partnership, please contact us via the contact page on our website.